This covers the Romanesque art, one of the crown jewels of the Museu Nacional d'Art de Catalunya. The museum is justifiably proud to house the world’s foremost collection of Romanesque murals, rescued during the 1920s from often neglected chapels in the remote valleys of the Pyrenees — and from wealthy Americans like the Rockefellers who were buying all medieval art they could lay their hands on, including entire cloisters on the French side of the border. Before their agents and their bags of cash could tempt impoverished villages to part with their treasures, Barcelona’s Ajuntament intervened, bought them up and brought them here, leading to the foundation of this museum in the Palau Nacional, as one of the few places big enough to house them all. Catalonia was quite well off at the very start of the Middle Ages, when, according to the chronicles, over 90 per cent of its business was transacted in gold—and in the Pyrenees much of that gold was exchanged for iron from its rich mines. All that loose loot attracted the top if ever nameless artists of the day, who were charged with filling chapels with images that could lead to their patron's eternal salvation. The artists based their images on Byzantine art and illuminations in Catalan Bibles, creating strikingly bold, expressive figures, sharply outlined and filled in with flat reds, greens and gold. Look at the photographs of the little, almost windowless stone churches where the murals were painted, and imagine the angels, saints and martyrs, with their riveting, staring eyes, cheeks with red clown spots, stylized stringy hair and weird elongated flipper hands gradually emerging out of the penumbra of sputtering candles as your eyes adjusted to the light— well, if they couldn't spook any sinner into the path of righteousness it's hard to imagine what would. Not surprisingly Miró fell in love with them at first glance. 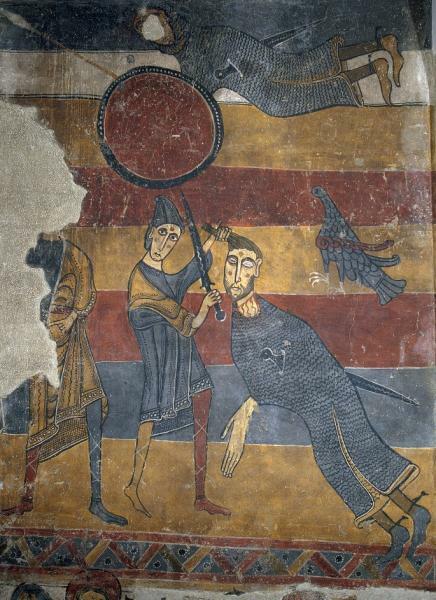 Among the most memorable are the strange and childlike scenes from the 11th-century Sant Miquel de Marmellar, whose artist could hardly draw a face, although like other painters he strove manly to depict seraphim just as the Bible described them, with six wings and 1,000 eyes. In the 12th-century Sant Joan de Boí, jugglers perform their art during the Stoning of St Stephen, while the hand of God descends from heaven to zap sainthood on Stephen with a laser beam. The rather more sophistacted paintings of the Pedret circle are attributed to a painter from Lombardy, whose frescoes from Sant Quirze de Pedret show a familiarity with the Byzantine art of Ravenna, notably in the dress of the Seven Foolish Virgins. 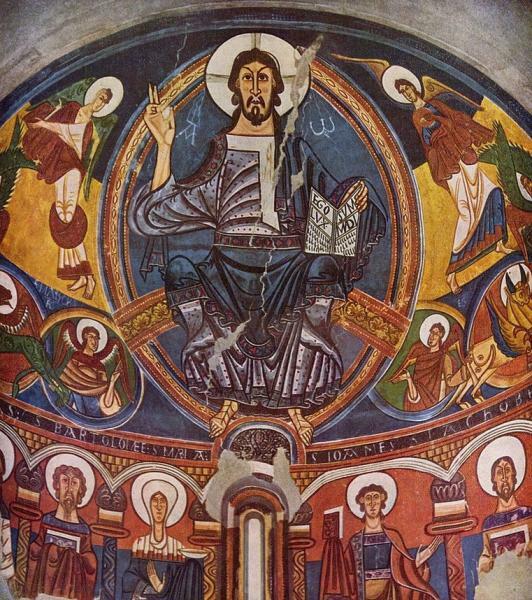 The Christ in Majesty in Sant Climent de Taüll (1123), is one of the most commanding and expressive figures of the early Middle Ages, filled with a grave sense of watchfulness, emphasized by angels and other wide-eyed figures. In Santa María de Taüll, the Virgin holds pride of place, while the Last Judgement shows some alarming scenes of hell and a truly bizarre David beheading a Goliath who looks like a sausage. Beyond are sculpted capitals (including some from Barcelona’s Sant Pere de les Puelles), a room full of polychrome Virgins, and a harrowing Deposition from Santa María de Taüll, in which the Christ, unusually, has moveable arms. The celebrated Majestat Batlló portrays Christ on the Cross, not in the agony so often favoured in Spain but dressed like a king, open-eyed and serene, in a beautiful tunic, symbolizing the triumph over death. Along with the murals are the remarkable altar frontals, either painted or in low relief. The 12th-century Durro Altar Frontal features comically surreal martyrdoms — the saints seem to be pondering what’s for dinner while being sawn in two or stewed in a pot, or having nails pounded into their skulls. Finally the Romanesque section has secular murals of a knife-winged griffon from the palatine room of San Pedro de Arlanzer near Burgos and the ceiling of the chapterhouse of Sigena in Aragón (1200). The latter was damaged by fire in 1936 but is still beautiful, its figures inspired by English miniatures and Norman Sicilian mosaics.